Kory Floyd's approach to interpersonal communication stemsfrom his research on the positive impact communication has on our health andwell-being. Interpersonal Communication personalizes learning forevery student no matter whom they are or where they are ensuring that theycome to your class prepared with the foundations and ready to improve their interpersonal skills and choices for their academic personal and professional lives through your teaching and coaching. 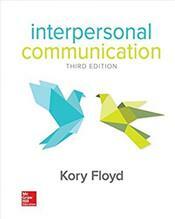 Kory Floyd's approach to interpersonal communication stems from his research on the positive impact of communicationon our health and well-being. Interpersonal Communication 3e shows learners how effective interpersonal communication can improve their academic personal and professional lives. By highlighting the latest scholarship; incorporating coverage of social media and technology in every chapter; and focusing on learners. relational emotional and physical health Floyd helps students build their communication skills in practical real world contexts.